A small charge of £5.95 is added to orders for orders on mainland UK. Highlands,Islands and overseas POA. We currently use Royal Mail and Hermes as our main carriers. Samples of all our products are available. Due to the high cost of administration, samples are charged in full but can either be used in a future order or be returned without a restock charge. Postage is none refundable. We accept all major credit and debit cards, as well as Paypal or you can apply for a Trade Credit Account. Embroidered and printed garments usually take between 7 and 10 working days from approval of artwork. During periods of peak demand or when products are out of stock, this may be extended however, we will keep you informed if this is the case. How will I receive my artwork proof? We always produce a proof for new logos' and designs. For embroidered and printed designs, logos and lettering, an email is for approval sent. Either way, we require an e-mail approval before we start production. We are not responsible for errors once a proof has been ok'd by the customer. I can’t see what I’m looking for. Do you supply it? Probably! If it’s workwear, corporatewear, teamwear, leisurewear, schoolwear or promotional clothing, we can usually supply it. Please contact us with your requirements. I’m not sure what I need, can you help? Of course. Please call us anytime between 8am to 6pm Monday to Friday and 9am to 1pm Saturday. You’ll find us helpful, informative and friendly. 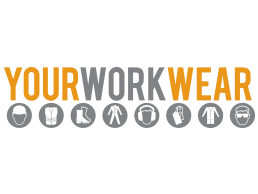 Alternatively, please send us an email to info@yourworkwear.co.uk. What does your free logo service include? Our free logo offers includes an embroidered logo up to 10,000 stitches in up to 15 colours or a 1 colour screenprint in 1 position. Larger stitch counts, extra print colours and additional positions POA. For embroidery we can accept most formats including pdf, .eps, jpeg, tiff or you can direct us to your website or send a letterhead. For screenprinting, to avoid additional artwork charges, we require an .eps tiff or ai file. If you are in any doubt, please contact us using the Get a Quote button on the top right hand side. Your Workwear will not automatically accept a return of goods supplied but if it does agreed to accept a return of goods then such return to be on the basis that there is a handling charge payable by the customer at the time of return based upon 20% of the total invoice price of the goods. Workwear points out that whether it accepts a return of goods is entirely at its own discretion excepting where the return of goods is as a result of the failure on the part of Workwear to supply the relevant goods in accordance with the order. Goods cannot be returned if individual design or embroidery work has been effected on such goods and/or the customer has used the goods and/or itself added the design or embroidery work.